Gov. 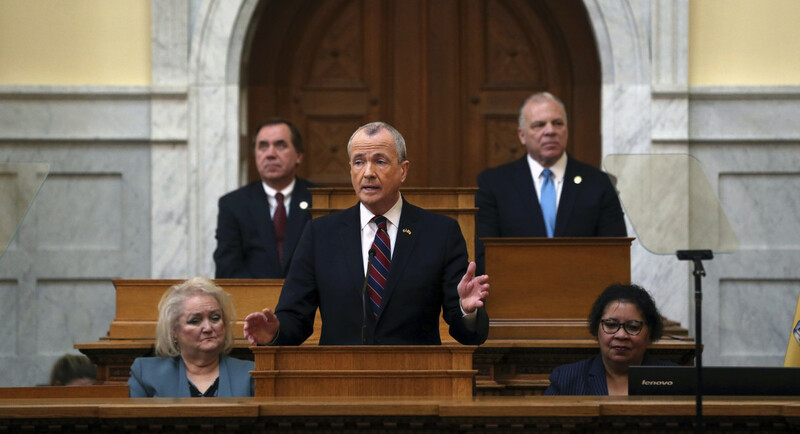 Phil Murphy used his first State of the State address today to applaud Newark Mayor Ras Baraka's response to a water contamination crisis that's exposed thousands of city residents to dangerous levels of lead in its drinking water. "We have inherited water infrastructure that is, in some places — as many of you know — a century old, if not older," Murphy said from the Statehouse. "Some of Newark's water lines were installed in the 1880s. Mayor Ras Baraka has been on the frontlines of this, and I applaud him and his team for their work to protect Newark's residents." At the Pequannock Water Treatment Plant, which services the city's North, South, Central and West wards, methods used to keep lead from flaking off the city's aging water service lines stopped working as early as 2015, causing lead levels to spike in residences throughout the city. Newark has been cited by the state Department of Environmental Protection on four separate occasions over the last two years. Newark officials, including Baraka, downplayed the scope of the water contamination until October, when the administration received a report on rising lead levels from environmental consulting firm CDM Smith. More than 1.5 million residents in the state are serviced by water systems that have demonstrated elevated lead levels, Murphy said. "Outdated infrastructure is a national problem, and it requires a federal solution," Murphy said. "My team and I will continue working with our congressional delegation to press the federal government ... for greater support and assistance — whether it pertains to clean water, or getting the Gateway Tunnel built. And we will get that built," Murphy said.